Piano Works - Fryderyk Chopin - Mediální ohlasy - ArcoDiva management - Hudební agentura - Hudební agentura ARCO DIVA Management s.r.o. Maria Gabrys selected from a wide range of Chopin’s oeuvre for her contribution to last year’s bi-centenary celebrations. As one might expect from a Polish pianist, she is a very fine Chopin interpreter and strikes just the right balance between the Classical and Romantic elements. Poise and poetic refinement are balanced with romantic passion and, when required, dazzling virtuosity. There is a great deal to recommend this recital so it is a pity that the total playing time is less than 50 minutes. She opens her recital with the perennially popular Fantasie-Impromptu which she takes at a brisk pace. The whirling right-hand figurations at the beginning are beautifully shaped and crafted while in the central section she allows the music to breathe and uses finely judged rubato and a ravishing tone to bring out the expressive and lyrical elements. Gabrys’ account of the two Polonaises were my favourite part of the disc. In the G flat major Gabrys captures perfectly all the lilt and swagger while balancing this with a restraint and poise that is so quintessentially Chopin. There was some wonderful delicacy and ornamentation in the Andante Spianato while in the Grande Polonaise, Gabrys’ virtuoso technique comes to the fore as she dispatches the complex passage work with ease. 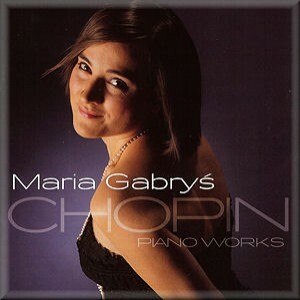 This work was delightfully characterised with some artful phrasing and rubato and in the coda Gabrys whips things up to drive her Chopin recital to an exhilarating conclusion.